With an increasing number of people suffering from obesity, heart disease, and other diet-related disorders, many of us turn to fad diets in an effort to drop excess pounds or recover our health. But what if our foods were doing more harm than good, and fad diets made matters worse? 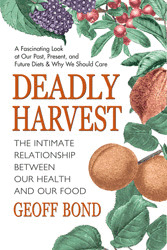 Deadly Harvest examines how the foods we eat today have little in common with those of our ancestors, and why this fact is important to our health. It also offers a proven program to enhance health and improve longevity. Using the latest scientific research and studies of primitive lifestyles, the author first explains the diet that our ancestors followed—one in harmony with the human species. He then describes how our present diets affect our health, leading to disorders such as cancer, diabetes, heart disease, and more. Most important, he details measures we can take to improve our diet, our health, and our quality of life. 1. What is Nutritional Anthropology? You will find the secret to what it means to be a human being living in close connection with our natural lifestyle. Everyone can use these ideas to enhance their image, inside and out. It contains the easy-to-learn skills of how to harmonize your eating with human genetic programming. We can make adjustments to our ways of eating, our ways of thinking, and our lifestyle so that they coincide as closely as possible with our inherited natural traits: they are the key to a healthy and harmonious life. In this book, we dub this process – of aligning our lives with the way nature intended – “The Bond Effect”.